On Saturday 12th July, 26 land lots were released for sale at Elizabeth Hills. The stage release was fully subscribed from the Priority Customer database and sold out by 2pm release day. 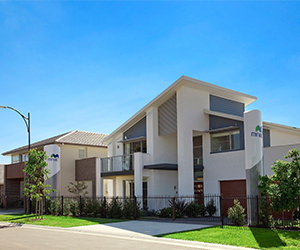 All purchasers are now in the process of selecting their new home from the Homes by Mirvac range. Located in the South West Growth Corridor of Sydney, the development has attracted strong demand since the first lots were released in November 2011. The new suburb has rapidly developed a reputation as a highly desirable location with purchasers attracted to the variety of choice and facilities. Elizabeth Hills is set on 56 hectares and incorporates more than 12 hectares of open green space with beautifully landscaped streets, the chain of ponds and a network of boardwalks, pathways, and cycle ways that link to the Western Sydney parklands. Prospective buyers relaxed in comfort, enjoying coffee and muffins as they waited for their appointment times. It was great to see so many repeat purchasers coming through, excited about the lifestyle that they were buying into at Elizabeth Hills.